Other Zenyatta players might be stronger, faster and/or literally Seoul Dynasty's Ryujehong, but this is, without a doubt, The One True Zenyatta. As part of Blizzard's Overwatch Contenders Trials series, a player from Thailand named Tae found himself smack in the middle of a veritable ult sandwich and decided to just go with it. Instead of fleeing from what appeared to be certain doom in the form of ults from an enemy Pharah and Zenyatta, as well as a hailstorm of various other attacks, Xavier stood stock still atop the payload. 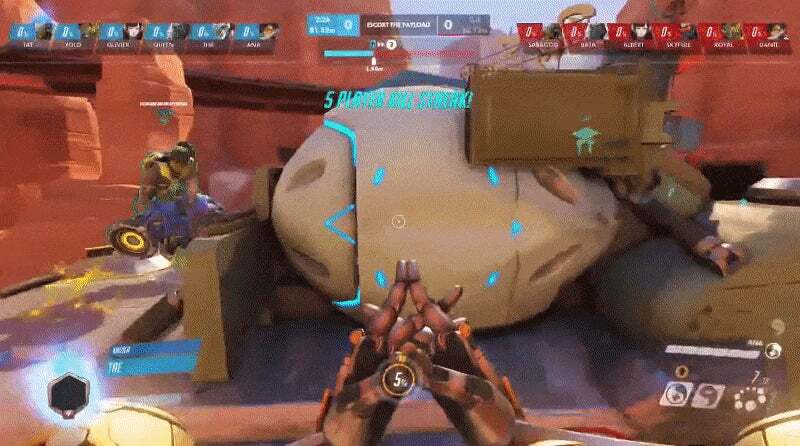 Then, just to drive home the transcendent level of meditative calm he'd achieved while staring Death in the eyes so hard that he bored a hole in his worm-filled skull, he had his Zenyatta flash a peace sign. Immediately after, he casually hopped off the payload and hurled a barrage of tiny wrecking balls at the other team's D.Va and Zenyatta, picking up Play Of The Game in the process. He did this all like it was nothing, because really, what do esports even matter? In the face of the universe's perfect harmony, what does anything matter? Aaaaah, it looked a little off on inspection, never played but I was curious if it was really as cool as it looked. It did look a little pretty cool though, and the stunned commentators were pretty funny.